Fig.1: The flagship mission JWST is jointly being developed by the US, European and Canadian Space Agencies. It will be launched on a European Ariane-5 rocket in 2021 and located at L2, and its 6.5m mirror will provide unprecedented sensitivity and spatial resolution in the near- through mid-infrared range (Image: NASA). These studies in the high-redshift, dust-enshrouded, and cool universe will be conducted in the infrared spectral region. 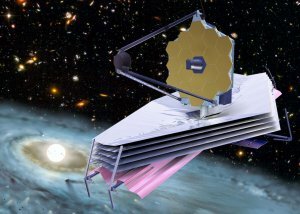 The 6.5m primary mirror of the JWST will allow for acquisition of images that will be as sharp as those taken by the smaller Hubble mirror in the optical range. To avoid blinding of the sensitive cameras by their own thermal radiation, the primary mirror is cooled radiatively to −230°C. This "passive cooling" is possible at the Lagrangian Point L2 at 1.5 million km in anti-solar direction from Earth. NASA is responsible for the JWST satellite which will be launched aboard a European ARIANE-5 rocket in 2021. JWST is equipped with four scientific instruments. The near-infrared camera (NIRCAM) covers the wavelength range from 0.6 to 5 μm. The camera can image fields of 4.4 x 2.2 arcmin² in several broad- and narrow-band filters and can be used as coronagraph. At the same time it serves as a wavefront sensor for the observatory, measuring the alignment of the 18 mirror pieces of the 6.5m primary mirror. 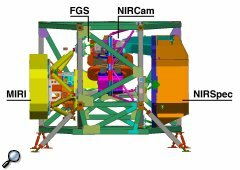 While NIRCAM is funded and built by the US, the near infared spectrograph NIRSPEC is being developed by ESA and built by Astrium, Germany. NIRSPEC allows simultaneous spectroscopy of more than 100 objects within its field of 3 x 3 arcmin². 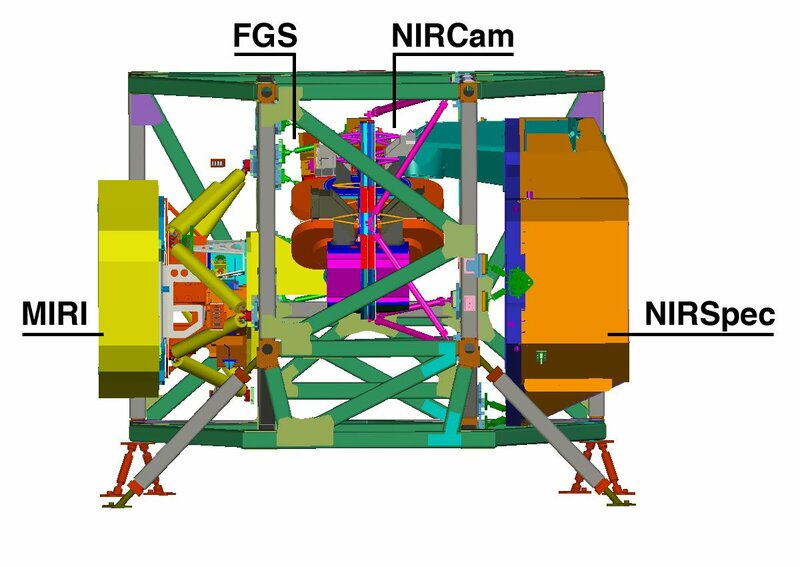 MIRI, a camera with coronagraph capability and spectrometer for the mid-infrared range (5 to 28 μm), is built by a consortium of 21 European institutes, with NASA providing detectors and the active cryogenic system. The fourth instrument, the Fine Guidance Sensor (FGS) is provided by the Canadian Space Agency. The FGS contains a dedicated guider and a tunable filter camera, which allows for narrow band imaging in the range from 1.6 to 4.9 μm. Common to all focal-plane instruments is that they have to be operated in a cryo-vacuum. For NIRCAM and NIRSPEC, a temperature of −240°C suffices. MIRI has to be cooled below −260°C so that its own thermal emission will not outshine the cosmic infrared radiation.